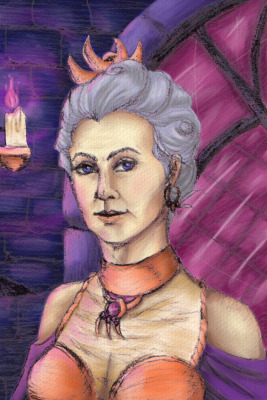 A portrait of the character Wynne from Dragon Age: Origins. I will draw a bust of your favorite character using mixed media. This was drawn on a 2.5"x3.5" card, scanned, then colored in Corel Painter X3. I'm mostly inspired by the things that I surround myself with. I'm really big on fantasy novels and video games and those are probably my biggest inspirations. Horror movies, novels, comic books, and my cats have also had an effect on me and what I create. I'm happy to do several different styles. I can do chibis, anime, and semi-realism with varied ways of coloring. I do portraits, full-body, line art, digital colors, traditional sketches, etc. Just ask me about anything and I'll tell you if it's within my ability to do it. Original characters and fanart are both completely fine! I reserve the right to decline a commission if I’m not comfortable with the content of the request. Check "What Type of Commissions Will You NOT Do?” to be sure! References, if you have them, would be excellent. Face-claims, dolls, and avatars are fine, too, if you don't have any original art. I would like a full explanation of what you want out of the piece. If you don't know, I just need permission to exercise my artistic freedom. ------------General Commission Info------------ -You will get a high resolution png. Most images will be published online (here, on tumblr, and on deviantart) unless you ask me not to. -If you want a physical print, it may cost more for printing and shipping. -The commissions are for personal use only. -Please send reference images or a very detailed description of your characters! - If you would like a custom commission that I do not have listed as available, please message me and we can talk price. Then I'll create a custom listing for you. -At the moment, I do not feel comfortable doing more than a simple background. If it's more complicated than anything in my gallery or examples, talk to me about it and I'll see about working something out. ------------Pricing Info------------ Sketches: PORTRAIT/BUSTS - 5 credits per single character commission FULL BODY - 7 credits per single character commission SIMPLE BACKGROUND - 12 credits Semi-realistic/Anime Line Art: PORTRAIT/BUST - 10 credits HALF BODY - 12 credits per single character FULL BODY - 15 credits per single character +10 credits per interacting character/ +5 credits for half body extra Semi-realistic/Anime Full Color: PORTRAIT/BUST - 15 credits FULL FIGURE - 20 credits per single character commission ~ 25+ credits for more complex outfits +10 credits per additional interacting character SIMPLE BACKGROUND - 20~30 credits based on what exactly you want. I'm willing to try things, but you should know ahead of time that it will likely be an experiment. Specialty: CHIBI - 15 credits per character. MIXED MEDIA PORTRAIT - 12 credits for a portrait with a simple background. 15 credits for more details backgrounds. TAROT ILLUSTRATION - 25 credits for a detailed, custom illustration of your character based around a Tarot card of your or my choice.